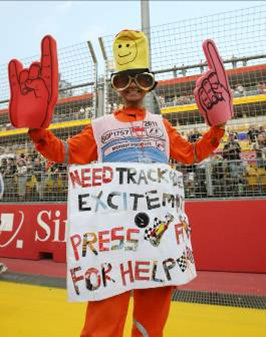 8 March 2012, Singapore – Singapore GP opens recruitment for 2012 FORMULA 1 SINGTEL SINGAPORE GRAND PRIX volunteer race officials today. Registration commences from 8 March, 11am to 31 March 2012. Interested candidates may submit their application via Singapore GP's official recruitment website https://raceofficials.singaporegp.sg. Interested participants will need to be 18 and above as of 1 January 2012, physically fit, fluent in written and spoken English, commit to all scheduled training sessions and available to participate in all four days of the race (20 to 23 September). Successful candidates for the 150 available positions will be notified by 25 April 2012. Depending on the area of responsibility, each marshal can expect to clock a minimum of 32 hours of training. First-time race officials will attend approximately seven days of theory and practical training, conducted over weekends. The first module which covers safety aspects, Formula One protocols and basic track and flag signals will commence in May 2012. Highlights of the hands-on training include performing recovery and extrication exercises on a Formula BMW open-wheeler and a Subaru WRX closed-cockpit car. As with previous years, selected senior officials will be given attachment opportunities in Adelaide, Melbourne and Darwin in Australia as well as Sepang, Malaysia to gain practical trackside experience. Since the inaugural night race in 2008, race promoter Singapore GP Pte Ltd has trained over 1500 volunteers to take on various roles such as observers, track marshals, flag marshals and fire marshals amongst other key trackside functions. Being close to the race action has attracted both local and overseas Formula One fans from 30 nationalities and resulted in a high retention rate of approximately 80% race officials returning to reprise their roles. "We have come a long way since the first night race was held here in 2008," said Gabriel Tan, Clerk-of-the-Course, Singapore GP Pte Ltd. "An example is the Michael Schumacher incident at Turn 8 last year, which was handled with utmost precision and coordination by the marshals. This is impressive, given that we host one international motorsports event in a year, and is a fitting testament to our marshals and training syllabus. We will strive to uphold the standards of international race officiating, and maintain our status as one of the best in the world."